Connie as a young fellow emigrated to the United States in 1950 and got work in New York and met many of the great stars of stage and screen – people like Frank Sinatra, Dean Martin and Marilyn Monroe. 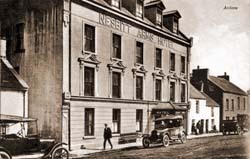 He returned to Ireland in 1965 and bought the Nesbitt Arms Hotel from John Byrne of Kilcar in October, 1965. Then, in 1967 Connie’s brother Fr. Frank met a Mrs. Fleming in Portadown and this lady told Fr. Frank that one of her daughters, Nessa, was a trained Hotel Manager and was about to emigrate to the U.S.A. Fr. Frank convinced her that a great job was waiting for her in the Hotel in Ardara, and in May 1967 this lovely young girl in a cute little mini and a cute little mini car arrived in Ardara. And as Connie says “I made her an offer she could not refuse” and in 1969 they were married. And of course their years in the Hotel hold very many special memories for all of us, the former staff. Indeed, nearly every family in the Parish had some connection with the Hotel – some member of the family had worked at some stage, in the bar, the kitchen, upstairs or on the farm. We all have different memories like; the people we worked with; the people who stayed; the characters who drank in the bar; the bands that played, and there was the farm. We remember the McHughs from Dublin (Michael and family), the Holmes from Belfast (George, Mirtle and their parents), the McKennas from Monaghan, the Hartes and the McKeowns from Mullingar and the many generations of the Flemings. Remember Johnny Porter, Mrs Peters and Charlie Dunleavy. The people who frequented the bar; Remember Larry Gillen, Francis Murik and all the others. So many of the great names played here – Big Tom, Brendan Grace, the Fureys, Paddy Reilly, Daniel O Donnell played there three times. Who could forget Frater and Gunn, the Scottish Comedians, and of course, as the late Charlie Bennett introduced her – nobody but nobody took the roof down like Bridie Gallagher. During the great summers of the seventies Connie had a set programme of music. The late Charlie Bennett and Kevin Keeney played every Monday night (Charlie and Kevin), Tuesday was always the Fanadians (from Inishowen), Wednesday we always had Charlie Cannon and the Emblems, Thursday was Paddy Gillespie and the Saloon Beats, Friday could vary with sometimes Frank and Johnny (Frank McGhee and Johnny D) or the Silver Wings with James and Benny until a rival Silver Wings led by a girl called Joan arrived on the scene. Saturdays always had Jack Ramsey, brother Allan and the late Donal Britton, known as the “Travelling Folk” – could we ever forget them. Sunday was the great Cara Melly and the Auctioneers and sometimes we had the “Starlites” with Michael Cannon, James Baker and Aidan Boyce. Searching for Connie’s cows was always an important job, they were either in Margaret Nancy’s garden, Josie Brennan’s field or their favourite spot – the graveyard. Connie’s particular love of football is well known. He was a member of the Monaghan team when he lived in New York and when he returned home he took a great interest in football and many well noted excursions took place to the All Ireland games. Amongst them was once in the company of brother Pete, Bernard Maguire and Larry Gillen. On another occasion with George Doherty and Liam Duffin. No one knows, but it is believed they enjoyed the game. But Connie was particularly proud when Down won the All Ireland in 1991 and he was so glad to welcome D. J. Kane to the Hotel with Sam Maguire to the G.A.A. Dinner Dance. But of course his greatest joy was to welcome Anthony Molloy to the Hotel on Monday 18th September, 1992, as Captain of the All Ireland Champions. No one could thank Con and Nessa enough for their kindness and generosity to us the staff. Indeed, only for them many of us would never have been able to fund our college costs and manys a person they helped out. Many of us remember when there was a fundraising dance for a minibus for the Comprehensive School. When they had counted the takings, they were well short of their target. When the Committee left that night, they had realised their target and we all know who helped out. Sad news reached Ardara on the evening of Friday February 23rd 2018 that Nessa Molloy had passed away after a difficult illness. Everyone who came in contact with Nessa knew they were in the company of a truly lovely and caring lady when in her presence.The many things Nessa did for us as a community could never be documented with true justice. Suffice to say she was special and we will never forget her. The huge number of people at her funeral, many having travelled from many parts of Ireland, was a small indication of the respect people had for Nessa. God Bless you Nessa take care of them all as you did on this earth.